This is a lovely quartz point that has wonderful lodelite inclusions, accented by gorgeous silver rutile, very similar to the Dream Domes or Shamanic Dreams. This is a 4.7 oz, 2.75” by 1.5” by 1.1” polished light smoky quartz decorated with buff, light toast, slate and deep maroon lodelite. The silver rutile only enlivens the landscape! You will also notice some teeny manifestors inside! He is full of joy, vibrancy and energy with special messages for his Keeper! Like Dream Domes, this point can be used for scrying and evaluating dreams. You sit in meditation (and I like my favorite incense burning and beautiful music playing like Fairy Ring by Michael Rowland or Novus Magnificat by Constance Denby). Wash with rainwater before and after use – it keeps the point clean and beautiful! Open both hands and cup the point between them … allow your mind to enter the world below. Ask questions and allow the answers to come. Now, understand that they may be in ‘code’ in that the information you get back will be symbolic. As an example, cleaning house may not represent physical cleaning, but rather sorting through ideas and beliefs that no longer work for you. 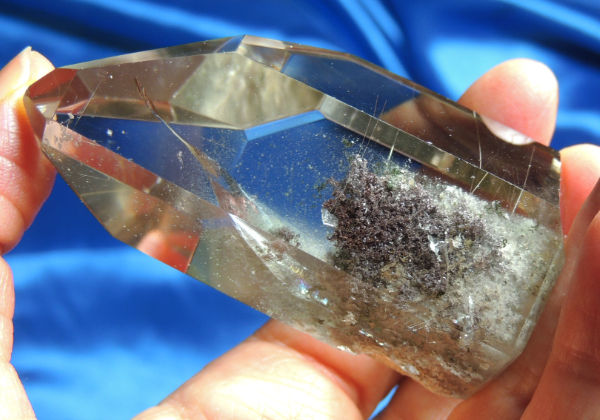 Be open to the possibilities and savor the time that you have with this rare and magnificent crystalline helper!